Completed in 2015, 1601 Wewatta Street played a large part in its neighbourhood’s enhancement. 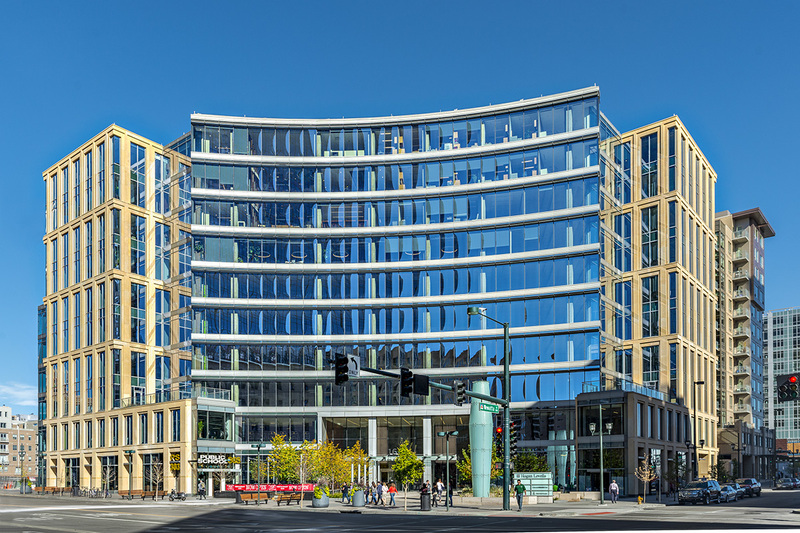 The 10-storey Class AA office tower is located in Denver’s Commons area, just west of the 125-year-old Union Station, which underwent significant redevelopment in 2014. More than 100,000 commuters descend on the Commons each day. 1601 Wewatta is clad in aluminum, glass curtain wall, and elegant stone cladding. Projecting glass parapets, horizontal sunshades, and unique cladding segmentation visually tie the tower’s cladding to the ground floor streetscape. Challenge: The building had aggressive goals for energy performance coupled with a unique, complex, and attractive design. As is often the case, design elements, such as canopies, terraces, and unique cladding elements, can create challenging lines, parameters, and shapes that are not conducive to good building envelope performance and complicate continuity of the building envelope in terms of air, vapour, heat, and water. Solution: Entuitive worked with the architects to maintain the desired aesthetic appearance while creating robust building envelope details to achieve high performance in both thermal and air leakage characteristics.